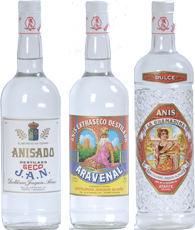 The anisettes produced by Destilerías Joaquín Alonso are made by distilling aniseed and select natural alcohols in copper stills. The result is the excellent quality of our end product. Sugar is added to the distilling process to make sweet and semi-sweet anisette. Dry and extra-dry anisettes are made by adding water to the distilled product until the desired alcohol content is reached. We still make our anisettes according to the same formula we have used since 1944.